Over the years we have become more aware of first responders, those brave and dedicated heroes who head straight into the midst of a disaster to rescue those in danger and bring back the missing. They are ordinary women and men who hear the cries of the injured, the terrified, and the dying and put aside their own fears to help. 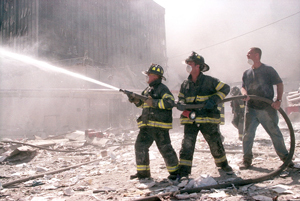 What compels first responders to put their lives on the line for strangers? What keeps them searching when the last light of hope has been extinguished? The words of today’s Gospel: “The greatest will be the one who serves the rest.” First responders model Jesus, who shows us that greatness in the Kingdom belongs to the servants and that authentic authority is grounded in an attitude of sacrifice and love. During Lent, Jesus calls us to become first responders. He calls us to become servants by allowing God to work through us in the midst of pain and suffering. He challenges us to use our gifts and talents to bring God’s compassion, forgiveness, hope, justice, and peace to our families, schools, workplaces, and communities. Will we accept His call and challenge, or will we run away from it?